Ascetic eccentric who served as a stretcher bearer during the war and has written more than 200 musical works. Long haired, energetic, darling of the avant-garde with a maverick intelligence and six children. Mystic, wit and wizard of electronic music who designed his house with sloping ceilings and hexagonal rooms, all lit from the outside. 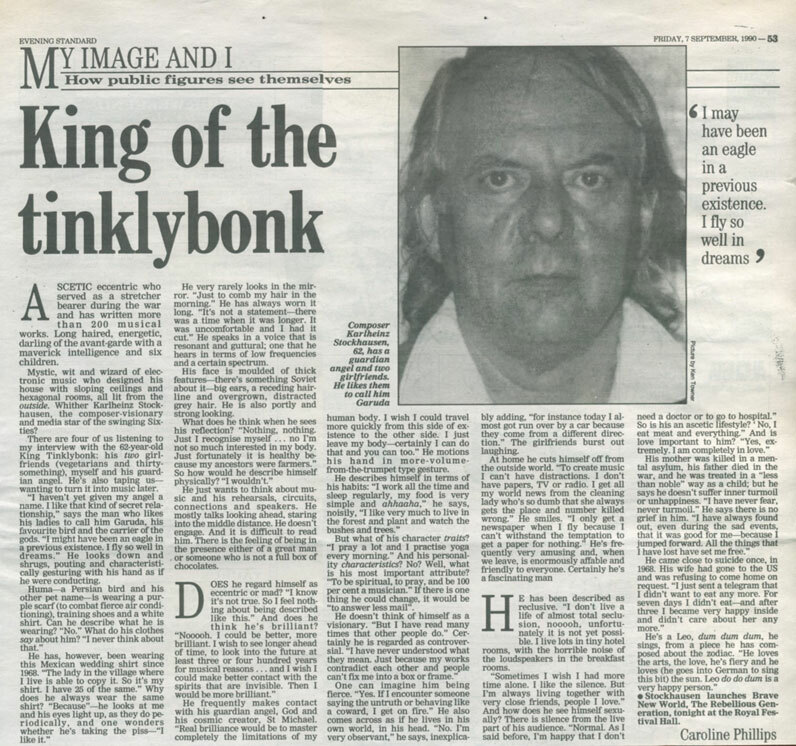 Whither Karlheinz Stockhausen, the composer-visionary and media star of the swinging Sixties? There are four of us listening to my interview with the 62-year-old King Tinklybonk: his two girlfriends (vegetarians and thirtysomething), myself and his guardian angel. He’s also taping us - wanting to turn it into music later. 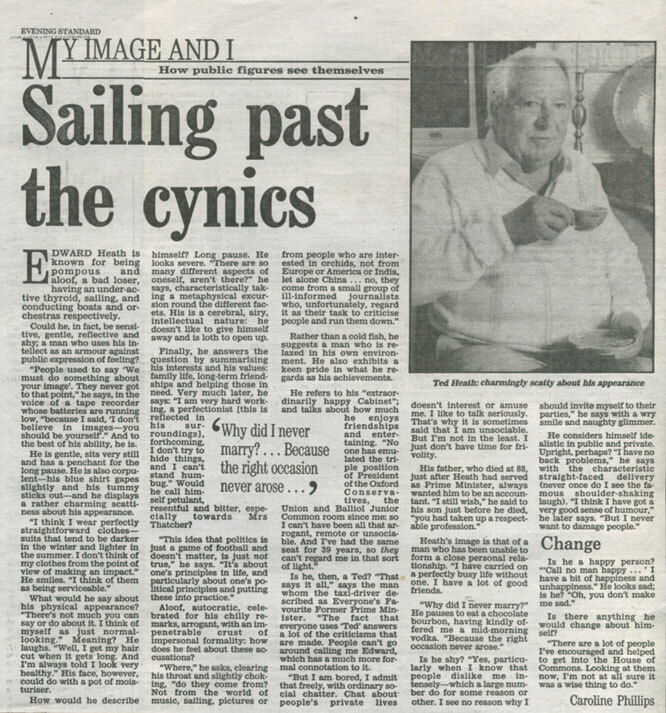 Edward Heath is known for being pompous and aloof, a bad loser, having an under-active thyroid, sailing, and conducting boats and orchestras respectively. Could he, in fact, be sensitive, gentle, reflective and shy; a man who uses his intellect as an armour against public expression of feeling? “People used to say ‘We must do something about your image’. 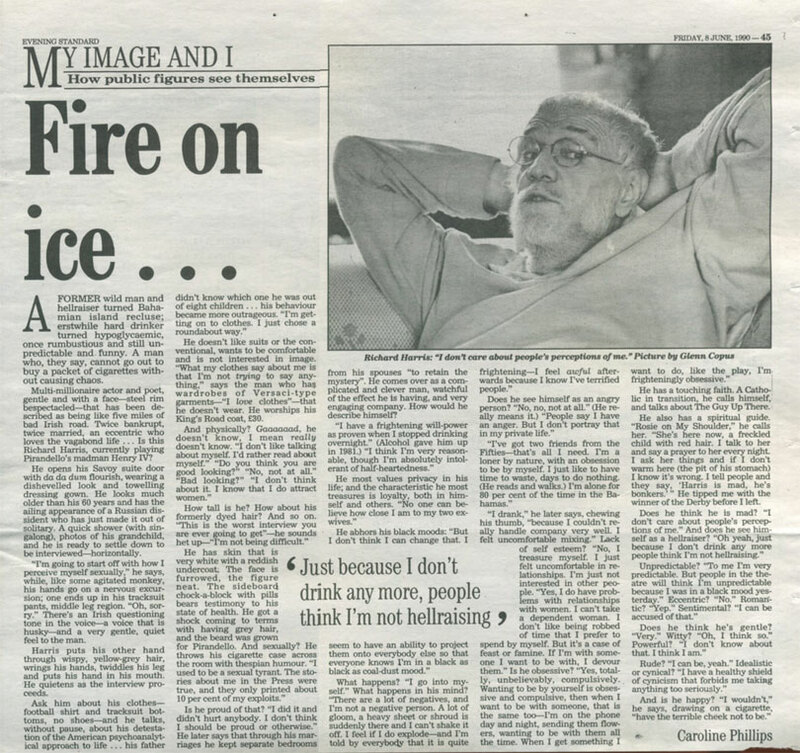 They never got to that point,” he says, in the voice of a tape recorder whose batteries are running low, “because I said, ‘I don’t believe in images - you should be yourself’.” And to the best of his ability, he is. A former wild man and hellraiser turned Bahamian island recluse; erstwhile hard drinker turned hypoglycaemic, once rumbustious and still unpredictable and funny. A man who, they say, cannot go out to buy a packet of cigarettes without causing chaos. Multi-millionaire actor and poet, gentle and with a face - steel rim bespectacled - that has been described as being like five miles of bad Irish road. Twice bankrupt, twice married, an eccentric who loves the vagabond life... Is this Richard Harris, currently playing Pirandello’s madman Henry IV?